Tom’s Hardware is a free Windows 8 Technical Support App with the help of which you can always have a personal technical support with you. It’s quite a useful Windows 8 app, for those who want to know everything about technical stuff. Sometimes, when you have planned to upgrade your desktop with the latest graphic card, or with the latest processor or RAM chip, however, you are confused what will be more suitable or beneficial for your system, you get stymied by the latest trends and technologies available at your nearby store. Here, comes the Tom’s Hardware Windows 8 technical support app into the scene. 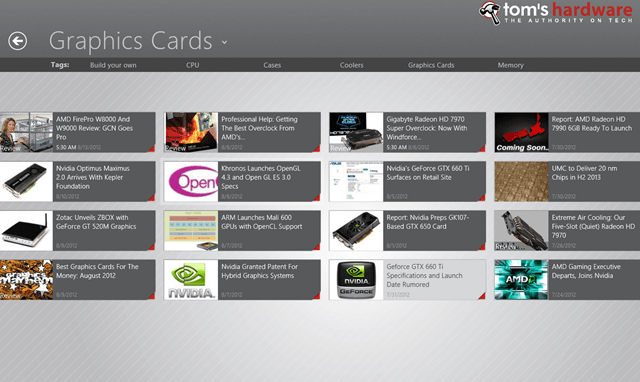 Tom’s Hardware app for Windows 8 will update about all the latest technical trends and gadgets in the market. And, with the current news about the latest technical stuffs. This Windows 8 app consists of reviews and news about all the latest technologies about which you would like to know. Just click on the specific section and all the information will be visible in front of your eyes. Tom’s Hardware consists of various categories you would like to know about like CPU, Cases, Graphic Cards, Memory, Coolers etc. If you are thinking to purchase a graphic card and you don’t know anything about this stuff or if you are confused that which one will be better for your desktop, an AMD or NVIDIA. 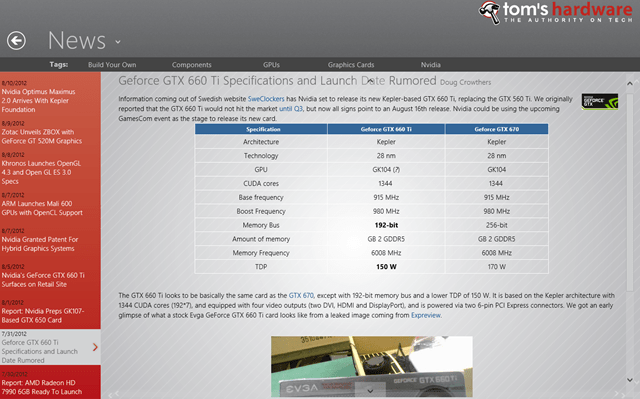 Select the graphic card option and you are ready to go. You can easily check the reviews and get yourself updated about it. Now if you ever want to buy some thing for your lovely PC, you don’t have to consult anyone. Just switch to Tom’s Hardware Windows 8 technical support app available under the ‘News & Weather’ category of Windows 8 store. Go ahead and get all the technical support you need.